Explore the landscapes of Southern Africa from the plush comforts of the Blue Train or Rovos Rail. In Southern Africa, luxury train journeys can be enjoyed on either Rovos Rail or the Blue Train. Both trains offer a travel experience reminiscent of a bygone era. The trains are luxurious beyond measure with fine dining, silken suites and chic decor. This is truly a unique way to travel between the top destinations in Southern African. Watch the countryside roll by while relaxing in the lounge car with you favorite drink in hand - an experience which is sure to be remembered. Rovos Rail is one of the world's most luxurious trains. It operates between Pretoria, Cape Town, Durban and the Victoria Falls on a regular basis. Longer journeys are also offered to Dar Es Salaam in Tanzania and Swakopmund in Namibia. Each train consists of a locomotive, a generator car as well as a staff car. Guests are accommodated in sleeper cars and, for guests' convenience, the train features a non-smoking lounge, two dining cars as well as a smoking lounge and an observation car. Each has been completely remodeled in wood panels, with a blend of leather, wood and luxury fabric used to decorate the lavish interiors. During the day, the dress code is smart casual. Dinners are more formal and gents are required to wear a dinner jacket. Rovos operates two classic trains dating back to the 1920's. The main train is able to accommodate up to 72 passengers. There is also another thirteen coach train which is available any time for charters. The coaches have been rebuilt and refurbished for absolute luxury and style. The Blue Train is one of the world's most luxurious trains. The train operates between Cape Town and Pretoria and has established a reputation as the ultimate luxury travel experience. There are two train sets; the first can accommodate 74 guests and the second 58. The trains travel at a speed of 90km per hour, which makes it possible to enjoy views of the surrounding countryside en route to your destination. 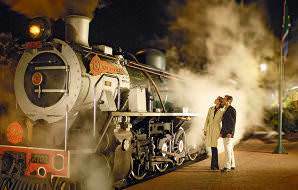 The Blue Train is a fabulous five star experience. What better way for travelers to enjoy the scenic spoils of South Africa as the train moves swiftly through the different landscapes, all the while being thoroughly pampered by skilled staff? Mealtimes exude excellence, from the highly sought-after Karoo lamb to Knysna oysters and everything delicious in between. The Blue Train also offers the means for business people to conduct a conference on the train for up to 22 delegates. Suites are well-appointed, each with their own bathroom fitted with either a shower or a bath. The lounge and dining cars emanate a sense of luxury and opulence. Meals of the highest quality are served in two sittings, with crystal and fine silverware adding to the experience. The train is equipped with televisions and a host of other modern amenities. Whichever route you intend to undertake, the journey is sure to be a once in a lifetime experience. Flying between destinations saves you time, but cancels out the invaluable intimate view of the country that you are exploring. Car trips offer panoramic expeditions, but if the distances are lengthy, it can become quite a tedious exercise. Enjoy the scenic route in the most memorable and convenient way by opting for a luxury train journey across Southern Africa. There is quite a bit of romance associated with the Africa of colonial times, when Europeans were still at the doorstep of new discoveries. The train journeys are reminiscent of this era, before the world was mapped out and technologies invaded personal spaces with their deluge of information and incessant communication. Unwind and hearken back to a time of novelties. Most passengers are blown away by the luxury and comfortable interiors of the trains. With exquisite meals, surprisingly spacious suites and refined service, you will truly find yourself aboard a five star hotel that happens to find itself in a remarkable new location as each hour passes. Despite your constant migration, you will want for naught. On train journeys to or from Cape Town, waking up in the Karoo is always a highlight. As the train snakes across the vast, arid landscape, the sun bursts from the horizon in dazzling explosions of pink and gold. The landscape is so flat and open, at this time of the day, you will find it hard to determine where the earth ends and the sky begins. The Rovos Rail's route to the town of Victoria Falls passes along the original bridge that spans the gorge. Reaching the Falls and watching the masses of water plummet downward as the train trundles by is always a momentous occasion. You are likely to hear the Falls before you see them, building the most pleasurable anticipation. Both trains take great pride in the fine fare available on their menus, all complemented by exclusive selections of South African wines. Local ingredients, like Karoo lamb, ostrich, venison and Knysna oysters, are very popular and prepared to perfection. The fanfare of the meals are crowned by exquisitely decorated dining cars. Where are the train journey departure points? The majority of train journeys depart from Pretoria. However, many are also available 'in reverse' from Cape Town, Durban, Victoria Falls, Swakopmund and Dar es Salaam. What are the durations of the train journeys? Depending on the route that you opt for, your trip can be anything from 27 hours to 28 days in duration. Are there set departure dates or can I just hop on? Yes, both trains have set departure dates for all their journeys. Be sure to book well in advance, as they are very popular. It depends largely on your needs. 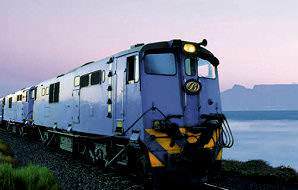 The Blue Train currently only operates scheduled trips between Cape Town and Pretoria, while the Rovos Rail goes much further afield. If you are considering the Cape Town leg and time is a factor, the Blue Train trip is one night (or 27 hours) in duration, while the Rovos Rail trip is two nights (around 48 hours). While both trains require semi-formal attire for dinner (jacket and tie for the gentleman, cocktail dress or smart suit for the ladies), only the Rovos Rail requires smart casual dress for other meal sittings. Are children allowed on the trains? While children are allowed on the trains, the journeys and luxury train lifestyle are aimed more at adults. Suites cannot accommodate additional beds or cots, so children would either have to share beds with their parents or be booked into separate suites at an additional cost. Furthermore, neither train offers special meals for children, and there are areas of the trains where children are prohibited. No child minding services or activities for children are available on either train. Will I have access to internet and / or mobile reception? Both trains limit the use of technology to preserve the atmosphere of a bygone era. Therefore, on Rovos Rail, there are no televisions, there is no WiFi or internet connectivity, and mobile reception is poor whilst traveling. Use the opportunity to unwind. The Blue Train has televisions and in-room telephones to call out. Yes, all suites have private bathrooms with toilets and showers. More plush suites will also have bathtubs. Can I opt for a partial train journey? No - both trains prefer guests to make use of full travel packages to ensure a comprehensive experience. Trips of varying durations are available, so there should be a journey to complement your needs. Accommodation, meals, all beverages, all mentioned off-train excursions and laundry (longer Rovos Rail journeys only) are included. Exclusions are limited to off-train drinks on certain Rovos Rail journeys as well as gratuities. On the Blue Train, external phone calls are charged at an additional rate, as are French champagne and caviar. South Africa's diversity as an African travel destination is legendary. Botswana safaris transport travelers to remote lodges with plentiful wildlife. Namibia's choice travel destinations are Sossusvlei and Etosha National Park. Travel to Zambia for an authentic safari in Kafue or South Luangwa. Zimbabwe's Victoria Falls make it one of the top African travel destinations. Mozambique is awash with secluded beaches and isolated islands. Combine your safari in Southern Africa with a green getaway for a comprehensive experience. Enjoy rounds on South Africa's finest courses. South Africa offers malaria-free wilderness areas, family-oriented entertainment resorts, blue flag beaches and a whole lot more. Regardless of the wilderness area you choose, the plushest palaces imaginable are available for a luxury safari in Southern Africa. Unwind in the temperate waters of the Indian Ocean, or sail across the deep blue swell of the Atlantic - our beach vacations offer a variety of activities.